Drivers may begin to see more roundabouts in their Pennsylvania commutes, as studies have concluded that they are safer than traditional intersections. One such study was recently conducted in the Lehigh Valley and found that there are 90 percent fewer fatal accidents in roundabouts than in intersections. They also found a 35 percent reduction in collisions with pedestrians. Unlike some traffic circles with lights, roundabouts are defined by yielding upon entry and operation without traffic signals. This study was conducted by RK&K, on behalf of the Lehigh Valley Transportation Study committee. The study recommended 26 roundabouts in the Lehigh Valley. PennDOT is also increasing the use of roundabouts on state roads, with a handful planned for construction in the next year in District 1. Slow down when approaching the roundabout and be prepared to yield to any pedestrians in the crosswalk. Approach the “Yield” line, look to the left and check for approaching traffic within the roundabout. Circulating traffic already in the roundabout has the right of way. Enter the roundabout when there is a safe gap in traffic. If necessary, stop at the “Yield” line until there is a safe gap in traffic. 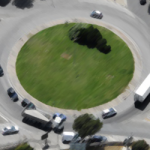 Upon entering the roundabout, drivers have the right of way and should proceed counterclockwise to their exit point. Drivers approaching their exit should use their right turn signal, watch for pedestrians in the crosswalk and be prepared to yield to pedestrians.